This kit is intended to replace the cylinders and pistons of a 80" shovelhead engine and increase the compression ratio to 9:1. Compatible with stock or S&S cylinder heads. 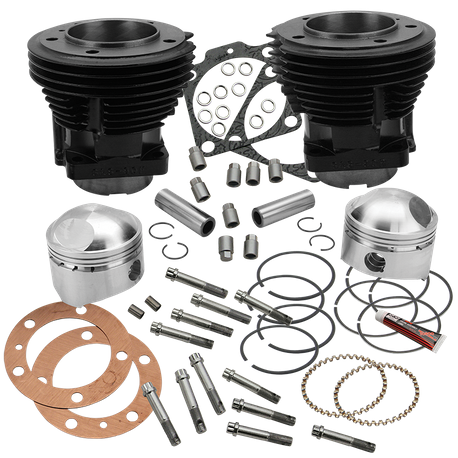 Kit includes S&S 3-1/2" bore high tensile cast iron cylinders, 3-1/2" bore forged high compression pistons for 80" (4-1/4" stroke) engines with rings and wristpins, head gaskets, S&S stainless steel head bolts with washers, base nuts, base gaskets. Pistons in this kit are not intended to be used on 74" engines. Very low compression and poor performance will result.